Americans have long shown their loyalty to both flag and country by pledging allegiance. That same word has rarely managed to enter the Irish lexicon, however, furniture polish excepted. To pledge is to make a solemn promise or agreement to do something, and few would argue that Ireland needs to do something to steady the ship – and fast. While the large jobs announcements by the Industrial Development Authority (IDA) are great to hear, they occur with a lot less frequency than one would like. The ones and twos are still being created on a daily basis, however. These albeit smaller good news stories unfortunately fail to register on the doom and gloom radar which informs much of the national discourse. A new initiative plans to change that by giving small and medium size enterprises a platform to announce that not only are they still open for business, but that they are also looking to hire. Hireland.ie is helping them to do this. You may already have heard about it, if not via the billboards up around the country, then perhaps their ad featuring Sean Moncrieff, or even their exposure on TV3. Not bad for a budget of €149. Twelve months previously, co-founder Lucy Masterson found herself once again lamenting the loss of yet more friends to emigration. While this in itself was sadly all too common, less common was the idea subconsciously sowed by her feeling of helplessness. Arriving into work the following morning, where she teaches a not-for-profit marketing class at Champlain College Dublin, she decided to replace the courses theory with something far more practical – and infinitely more risky. The class could hardly have expected what they were to hear that morning. “We want to try to motivate the business community in Ireland to take one more person on in 2012. We’ve no money, we’ve no nothing; so how are we going to start a movement?” she tells me, recalling the call to arms speech she declared to her still half-asleep students. Those same students were to relish the challenge, however, eager to get their teeth into something real. For the 18 of them who set about the initial brainstorming, she outlined the risk, not mincing her words. “At worst, you’ll have to repeat the semester, and I’ll get fired,” she stated. Twelve months on and the Lucy I speak to still can’t believe how far things have progressed. A humble Facebook page was the first step, a simple, effective, and above all free way to test the waters and judge the national appetite for something new and different. Before long, 1,000 people had liked the page. Surprise and joy was soon replaced by the weight of responsibility of now having to take it further. “What are we going to do with this,” she wondered. Surprisingly, advertisers were soon on board. Refreshed by the positive outlook, they were willing to work for free. Quick to credit them, Lucy believes their belief has been key. “It’s been a collective of people saying ‘let’s think differently’,” she says. “The big jobs announcements are great news stories but what about the small employer who is creating jobs in their ones and twos. They’re hugely important for this economy too. Nobody is really celebrating them,” she says. Her message was clear, and now the people were in place to help spread it, but where would the attention be focused? It was time to overcome another hurdle. What needed to be set up was essentially a job site, a place where companies could pledge jobs and job seekers could search them out. Help with this came from a surprising and highly unlikely source, in the form of Jane Lorigan, Managing Director of IrishJobs.ie and, in turn, co-founder of Hireland.ie. Despite the inherent competition of the new site, she loved the idea, taking it on in a personal capacity. Launched on the 16th of January, Hireland.ie came to life with one simple goal. “We want to make a big fanfare about the one, two and three jobs that are being created around the country. When these are put together on one site, it creates a footprint,” Lucy says. The wheels of the PR machines began to turn, leading to over 3,900 pledges from Irish businesses on the site to date. No mean feat, despite Lucy’s protestations that the end goal “is not a numbers game.” With the initial publicity came naysayers, however – not to mention some dirty tricks thrown in for good measure. Faced with criticism about pledges not being the same as jobs, Lucy is only too aware that the real measure of success will not lie in pledges, but in the jobs created. “Pledges are one thing, but we want conversions, and we want to know those pledges that don’t turn into jobs,” she says. A large part of the work going forward will be the following up of those who have pledged, ensuring that companies have more in mind than free publicity. To this end, companies who have pledged and subsequently hired will be shown as having done so through adding badges to their online profiles, which will help to raise theirs while at the same time show up those that haven’t come through. A quick glance at the site shows the diversity of companies out there who are looking to hire. From a candle factory in Galway to a dance studio in Dublin, both are looking to hire a single person. The pledges may be small, but the effect on the person they hire is anything but. As with traditional job advertising, filling positions can take time. It is happening, however. Just ask Jennifer Harte, whose success in filling one of the six positions offered by Hauste Group in Cork has given her the distinction of being the first person to find a job through Hireland.ie. For those for-profit companies whose job it is to advertise and fill jobs, Hireland.ie may already have been seen as a threat. In their first weeks online, Lucy received calls from companies who had pledged through the site, only to receive calls from recruitment companies asking if they wanted help filling the positions. Shocked by this, Lucy knew something had to be done – and quick. It may still be early days, but Lucy firmly believes that she’s “onto something too big to walk away from.” So just how big could this grassroots movement get? Stanley Rapp, an American marketing expert and author heard about Hireland.ie and, through a joint initiative, has set up a sister company in the US, called UHireUS. In 2012 it hopes to create one million jobs and has the backing of the Clinton Global Initiative. Not bad for an idea forged around a Irish kitchen table 12 short months ago. While Lucy firmly believes that the work that organisations such as the IDA do to be great, herself and the rest of the team want to remain firmly committed to championing “the small guy in his canoe with one paddle.” If you’re a small business looking to hire and you fit Lucy’s description, remember that you’re not lost at sea. Hireland.ie wants to hear from you. “I would have had no interest or knowledge of anything associated with disability up until then,” I’m told matter-of-factly over the phone. If Dubliner Stephen Cluskey hadn’t gone to work on that fateful day 10 years ago, he probably still wouldn’t. But he did. At 18, Stephen had just entered his Leaving Cert year. The set of exams undertaken by those on the cusp of adulthood and independence are often looked back on with overwhelming relief by all who have sat them. While Stephen’s Leaving Cert also signified his transition into adulthood, independence was not to accompany it. By the time June of 2002 had arrived, he was part-way into a 16-month stay at Dun Laoghaire Rehabilitation Clinic, the result of a farming accident which had left him with a broken neck and a forever altered future. In the decade that has followed, not a lot has changed for him medically. But that’s only half the story. The hourly, never mind daily obstacles he has faced have made the easy, pre-2002 tasks immeasurably harder. His business mind, sharpened by the distance-learning business degree that he has been taking for the last 3 years, is helping him to view these obstacles as something completely different – business opportunities. Having travelled to America and Portugal over the years for treatment, what should have been a non-issue soon became an unwelcome distraction. “I really struggled with public transport over there,” he says. Things were very different when Stephen had travelled to London for similar treatment. “In London, every taxi is wheelchair accessible, which I think is something we should be working towards,” he says. While the latest grant scheme for wheelchair accessible taxis by the National Transport Authority (NTA) may increase the numbers somewhat (see below for more), the numbers are still far too low in Stephen’s eyes. “It’s not going to make a huge impact by any stretch of the imagination,” he says. Far bigger a problem, however, is finding one of these taxis when you need it. Take Co. Tipperary, for example. 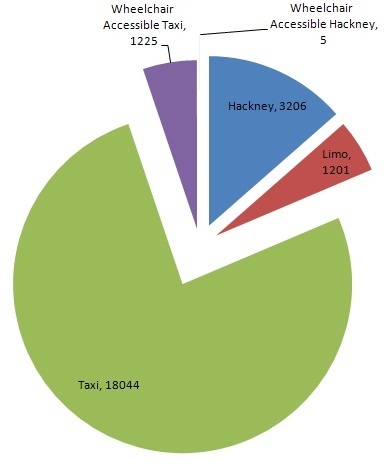 As of the 31st of January 2012, figures from the NTA show that only 4 out of 267 taxis and hackneys were wheelchair accessible – less than 2%. To put in another way, someone who is wheelchair-bound and who finds themselves in Tipperary has a less than 1 in 50 chance of getting a public service vehicle that can actually take them where they want to do. Something needs to be done, and Stephen is managing to do it. “After a lot of research, I realised I wasn’t the only one suffering from this problem,” he says, when recalling the logistical nightmares which have too often taken the fun out of trips or, worse again, prevented them from happening in the first place. Launched at the beginning of February, www.wheelchairtaxi.ie is his brainchild. The best ideas are often the simplest ones, with Stephen’s definitely falling into the why didn’t I think of this before category. Offering a way for drivers of wheelchair accessible taxis to register their services through the website has so far led to nearly 70 to date. Users can then find wheelchair accessible taxis in their locality. Realising that the site is unworkable without suitable taxis, taxi drivers or those looking to use them are not required to pay any fees. Helping to solve a major problem which in turn makes your own life easier in the process doesn’t mean that you can’t turn a profit, however. Having already spent approximately €1000 on getting the site to where it is today Stephen neither expects charity nor seeks to run one. With a business model in place which he believes will turn a profit, from next month the site will list more types of accessible transport. Having gotten details from the Taxi Regulator, Stephen has personally sent out text messages via the internet to every taxi driver in the country to alert them of the website. Circumstances may have changed how he interacts with technology, but it has also proved to be the great equaliser for him over the last decade. Describing our initial contact via email, he tells me how software transformed his words into text, ready to be sent. “A head mouse, which is like a sensor which sits on top of a computer allows me to move my head and the mouse moves with me. To click I hold it in the same position for a second or two,” he tells me, describing the process which has now become second nature to him. They say the best ideas are often the simplest ones. So why didn’t we think of that? On the 1st of February 2012, the National Transport Authority (NTA) launched the second Wheelchair accessible Grant Scheme, which made €165,000 available for the upgrading of licensed vehicles to be wheelchair accessible, along with an additional €85,000 for those wishing to enter the profession. For those looking to upgrade, the payout per recipient is capped at €15,000. If each recipient were to receive the max payout, this would result in the conversion of only 11 taxis nationally, with funds being split 50:50 between Dublin and the rest of the country. Speaking to Joanne Coffey, whose PR firm represents the Commission for Taxi Regulation, the first Wheelchair accessible Grant Scheme resulted in 16 new vehicles and 5 conversions. Using the earlier example of Tipperary, however, it only increased its number by 1, from 3 to 4. While ideas such as www.wheelchairtaxi.ie have the ability to improve lives, another initiative is hoping to use technology to potentially save them. Currently being trialled until the end of June, those who are deaf, hard of hearing, or speech-impaired can register their mobile phone number along with other personal information, including any medical conditions, using the website www.112.ie. In the event of an emergency, a simple text from the registered mobile phone to 112 (the Europe-wide emergency number) will automatically be passed on to An Garda Síochána, the Ambulance service, the Fire service, or the Irish Coastguard. For more information, check out www.112.ie.